A Bent’s Old Fort National Historic Site interpretive ranger recommended a book focusing on living history sites across the country. 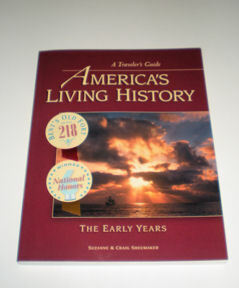 Fortunately the bookstore/trade room had copies of American’s Living History – The Early Years. After a brief browse I knew we needed to add this title to our travel bookshelves. Authors Suzanne and Craig Sheumaker selected 300 sites throughout the US that are historically accurate and offer history-based activities, re-enactments and/or special events. 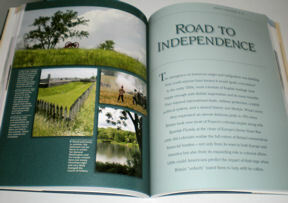 The Sheumakers visited each of the 300 locations before compiling the book, plus many others that did not make the cut. “The Early Years” refer to the fact that the authors chose to focus on destinations reflecting pre-1840 history, from early Native American cultures to the opening of the West. 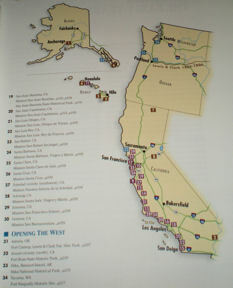 Regional maps and listings provide visual destination locations while themed chapters are organized by field of interest. At first I found the organization a bit awkward but after reading the introduction, historical timeline and several entries I realize the groupings are logical and practical. 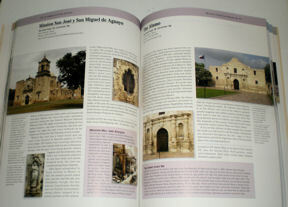 Each chapter begins with a short historical perspective, followed by individual destination descriptions and photos. Craig’s professional photography expertise enriches every page. The descriptions offer concise background knowledge and visitation highlights. Frequent sidebars add informative mini-lessons of American history. “Wouldn’t it be great if school history lessons were so interesting? The award-winning book doesn’t try to provide every detail of hours, fees, restrictions, etc. – dull details that make a book dated by the time it arrives from the printer. Instead, contact info including websites are listed for the reader/traveler to find the latest, accurate details needed for a successful visit. I couldn’t resist the urge to count how many of the sites we’ve visited – 52. In reading many of those entries I find the Sheumakers’ information extremely factual. Terms such as, “exceptional, meticulous, charming or terrific” are used accurately not as hype. Whether one is an on-the-road RVer or an armchair traveler they will be entertained and enriched by America’s Living History – The Early Years. I hope the authors are compiling a follow-up edition covering “The Later Years.” There are many sites dating after 1840 that offer quality living history experiences, especially in the west where settlement was in it’s infancy in the mid-nineteenth century. Meanwhile I need to get on the road to visit the other 248 locations. America’s Living History – The Early Years is available online at both Amazon and Barnes & Noble or at museum stores across the country.